This easy yogurt dip also happens to be one of the best yogurt dips out there – both in terms of flavor and health benefits. 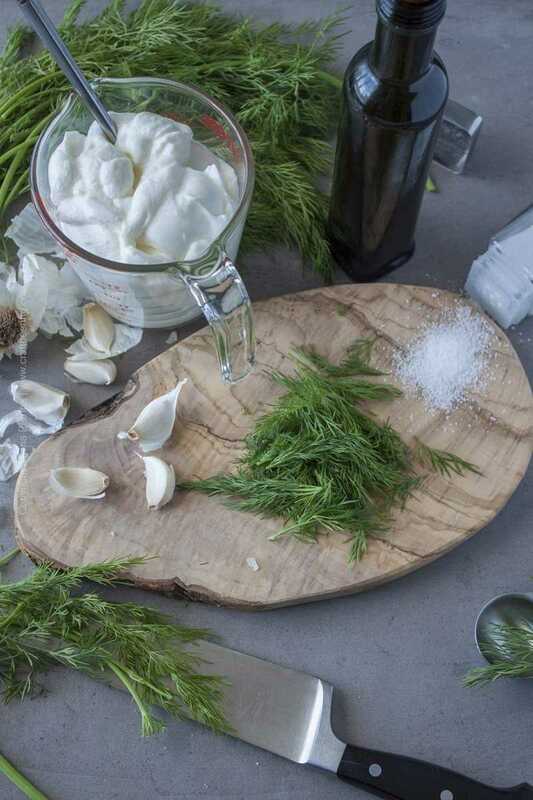 Made with creamy, cultured in the cup plain yogurt and generous quantities of extra virgin olive oil, garlic and dill. It provides probiotics and prebiotics and is naturally rich in protein. And it is outright delicious. If you are a frequent craft beer drinker (and eater of the accompanying, often less than healthy, pretzel kind of beering snacks) you need something like it in your daily diet to hopefully counter the effects of consuming alcohol and the high glycemic index foods that go with it ((https://www.health.harvard.edu/diseases-and-conditions/glycemic-index-and-glycemic-load-for-100-foods)). The same applies to bread eaters, soda drinkers and even freshly squeezed fruit juice drinkers (without the fiber the juice of two oranges leads to a much higher rise in blood sugar as opposed to actually eating two oranges ((http://www.lowglycemicload.com/glycemic_table.html))). Or maybe you take or recently took antibiotics. Then you definitely need to be eating this versatile savory dip. In copious quantities. The yogurt dip is adapted from, or rather forms the base of, a Bulgarian cold yogurt soup known as tarator. Add diced or grated cucumber, water and crushed walnuts to it and it will become tarator. Add diced cucumber and lemon juice instead and you will swear it is tzatziki and I have no clue what I am talking about. But I do. Look at a map of Europe, or even better, look at a historical map of the Balkan peninsula and you will realize that vast parts of the territory of modern day Greece were Bulgarian territories over the centuries. The outcomes of many wars lead to lands changing hands, but the food favored by the inhabitants of those lands remained the same regardless of whether the territory was considered Greek or Bulgarian. I am only mentioning this to drive home the point that the cuisines and food traditions of the area are beyond intertwined. And food traditions are powerful drivers of taste preferences. I would never, ever put parsley in a yogurt dip because it doesn’t taste right to me. 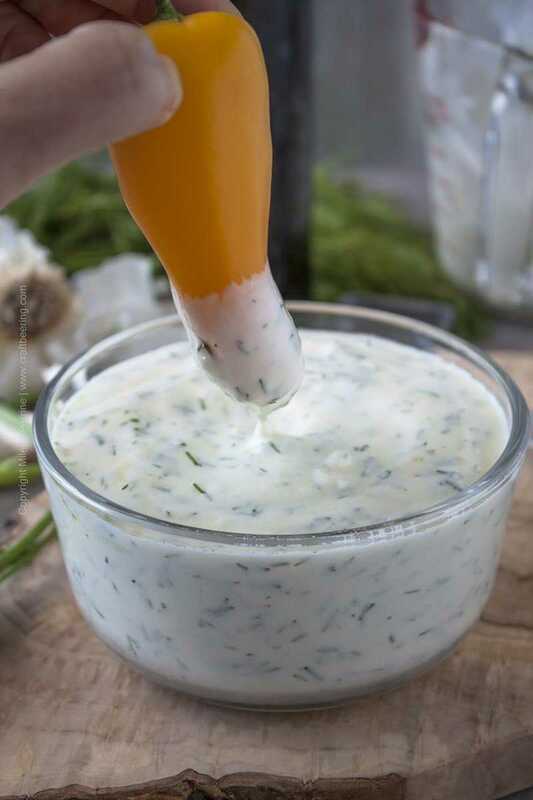 I love parsley, but it just does not belong in tarator and hence yogurt dip, lol. After you try this dip you might decide to make it a staple in your fridge. You may even start doubling the quantity of the recipe. It is that tasty in its simplicity. I’m keeping my fingers crossed. I usually whip up a quart at a time and it’s gone in about a week. Whenever hunger strikes (usually right before lunch time since on weekdays I don’t eat breakfast) I can resist the temptation to reach for chips or cookies or something that comes out of package. We always have some kind of fresh dippable vegetable in the fridge – a few mini sweet peppers or a few asparagus spears (another powerful prebiotic) do the trick. It is a great habit to have when drinking craft beer and eating all kinds of food is your passion. Chris and I like the idea of balance, a middle road – we never over indulge, but indulgence has its prominent place in our lifestyle. What is the point of being alive if you will not enjoy a brownie sundae once in a while? Or a good cocktail, or a juicy, perfectly grilled steak with a bunch of fried onions on top. Plus, you never know if a careless truck driver won’t end your life tomorrow despite all your well intended adherence to austere, super healthy practices. Here are our favorite ways to consume yogurt dip. Just to get you started on your own path of its daily consumption. Hopefully you too will make it a habit to keep yogurt dip in your fridge at all times. 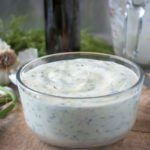 Because it is packed with probiotics (good bacteria rich plain yogurt) and prebiotic (garlic) this dip can perform wonders for your gut micro flora and as a consequence for your overall physical and mental health. And your good mood. It can also combat the negative effects of sugar consumption. And don’t forget the anti-inflammatory properties of extra virgin olive oil. A couple of the lactobacillus strains contained in yogurt (you must use real cultured in the cup plain yogurt with live bacteria) are associated with weight loss and control. I talked about those strains in this post for Kimchi & Green Apple Salad. The same souring agents are at work in yogurt, with the same figure slimming properties. To refresh your knowledge of terms related to gut health, probiotics and prebiotics and to find out about our philosophy on health and craft beering, read this post. Below is a list of books that can help you understand the full scope of health benefits brought about by consuming probiotics and prebiotics. The subject matter is nothing short of fascinating and these three books are the best I have read on gut health (I have read quite a few over the past three years). The minced garlic tends to settle towards the bottom once the dip has sat refrigerated in a container. And if the yogurt you used had a higher water content, tiny pools of water may form on the surface after a day or two in the fridge. Fear not, just give the dip a quick stir and it will be just as creamy as on the day you made it. And you should know that the flavors develop after a day and it you can count on it becoming even tastier. Delicious, healthy and super easy yogurt dip. Must use quality ingredients to reap benefits. Serve with fresh or grilled vegetables, fries, lamb, chicken, pork etc. Mince the garlic as small as you can. Place in a small bowl. 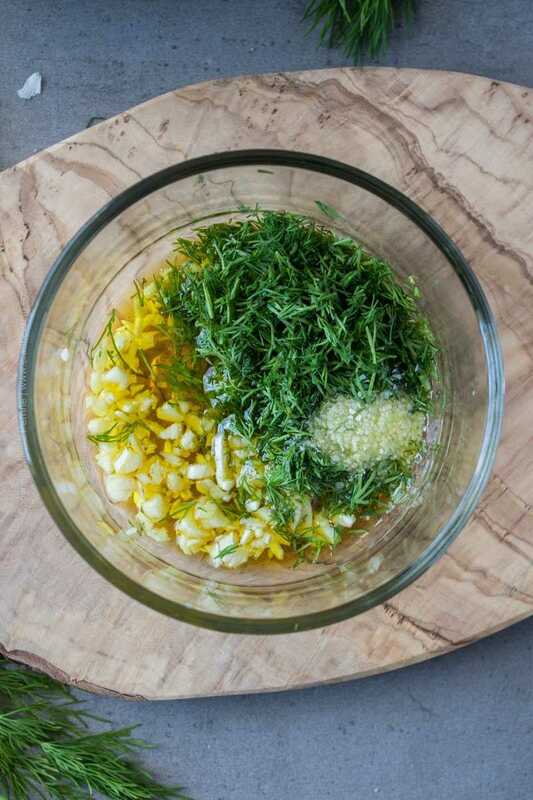 Add the finely chopped fresh dill, the salt and the extra virgin olive oil. Mix well with a fork. Add the yogurt and mix with a fork until all ingredients get incorporated in the yogurt. I love a good yogurt dip and this one totally fits the bill. 🙂 Probiotics do wonder for my body, there are crazy health benefits and usually always relives my tummy ache. I would love to try some Bulgarian Cold Yogurt Soup, it sounds pretty tasty. Wait I think I’ve made a yogurt dip like this to go with my spanakopita. I love the taste of dill. This looks like a great dip! Nicely written & explained. I agree with everything you have here. It is worth mentioning that our microbiome is affected by other things i.e. environmental contaminants such as heavy metals, pesticides, GMO”s can all disrupt the microbiome as well as poor diet (lack of prebiotic, fiber, etc). Avoiding these contaimnants, detoxing, proper diet then re-inoculating can re-establish. Right? Dill for the win! 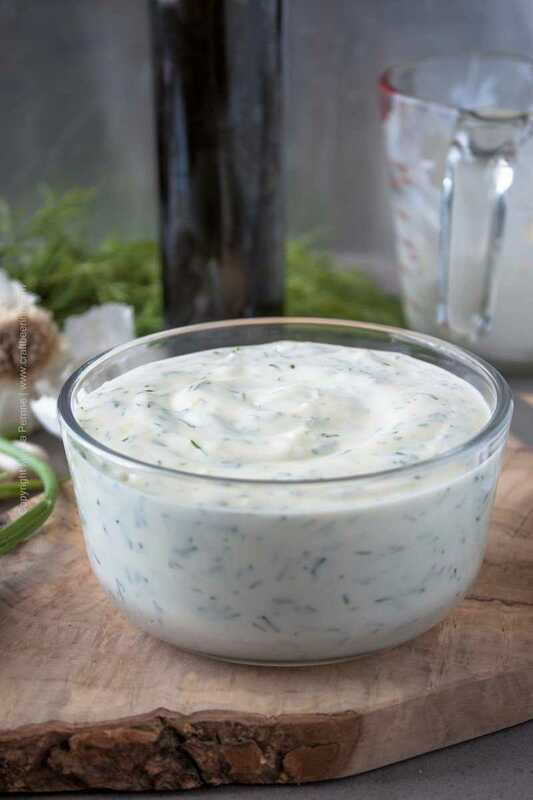 Seriously, anytime I make a yogurt sauce/dip dill is the star of the show (at least for me) I can’t get enough. I straight up drooled when you suggested serving the dip with chicken skewers. I’m dying for grill season. If I close my eyes I can imagine myself dunking the chicken and veggies into the dip with my favorite beer in tow. I can’t wait to make this daydream a tasty, tasty reality! Pinning! I love the book Brain Maker! I’ll have to check out the others you mention. It’s amazing (but I guess not surprising) how everything in our bodies is so connected. 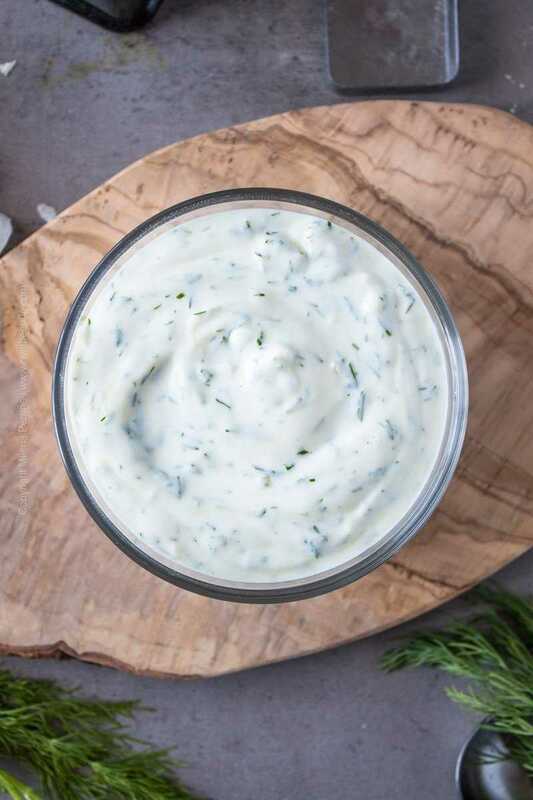 And this dip sounds delicious; I’m a dill and garlic fanatic and I eat yogurt just about every day so I’m totally trying this dip soon. Happy Friday!